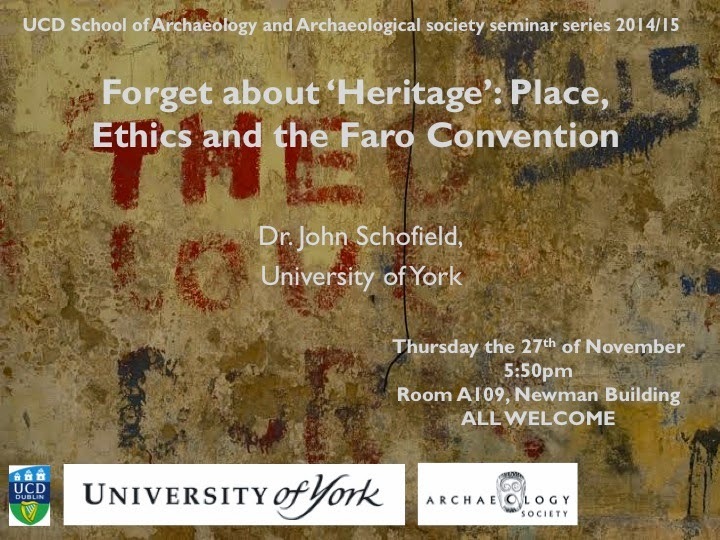 On November 27th, Professor John Schofield, head of the Department of Archaeology at the University of York, addressed the UCD school of Archaeology about what heritage means in terms of place and the perception from different people. Professor John Schofield is also the Director of the Centre for Applied Heritage Studies as well as a member of the Society of Antiquaries of London. The critical point that Professor Schofield emphasized was that Heritage was a universal right for everyone. This principle is also mentioned in the Universal Declaration of Human Rights, Article 27 that was declared in 1948 in the United Nations (UN). It addresses that an ethical approach to heritage should be in accords with moral principles, specifically this link to heritage and human rights. To address the concept of heritage as well as issues face with it, the Faro Convention considers the value of heritage to society and seeks to make it available for everyone to participate it in. This European convention works to put the people and human values at the centre of heritage sites based on the principles that a historic environment is a shared resource and that everyone should be able to participate. The need to involve everyone involves, as Professor Schofield describes, finding creative ways to get the whole community involved. This concept led to the interesting idea of having the homeless community as well. The reason for this was that it is typically associated that the homeless do not have a home and there for cannot offer insight into heritage. However, heritage, as Professor Schofield says, is about place, and should be for everyone. Through a group called Common Ground, an organization founded in the UK, they seek to promote local distinctiveness among communities as well as to promote heritage engagement among everyone. Heritage engagement involves places and our relationship with them, which Professor Schofield remarked, changes from person to person because of what they perceive as aspects of their heritage important to them. A way to demonstrate this was by asking people to draw Parish maps within their community. The maps were designed by various communities, each one distinctive in how they portrayed their sense of place, some maps having a more aerial view of the village, while others would have text written by different places, which would tell different stories about the site, offering a history of the place as well as its significance to the community. An example of a Parish map that Professor Schofield highlighted was one drawn by a young black musician named Pyro from Wavertree, Liverpool, UK. Wavertree has had a history of gang fighting within its community, leading much of the community into poverty. Despite his poor education, Pyro drew a Parish map of places that the found important to him within his own sense of place, offering insight into the activities of the community. Professor Schofield also talked about a project that he worked on Turbo Island in Stokes Croft in Bristol. As a way to get the community involved, Professor Schofield extended the offer to the homeless as well to help participate in the excavation of the site, which was helpful in identifying material culture that the homeless identified with because it is a part of their lifestyle. The excavation itself lasted only 3 days but through this, Common Ground was able to extend understand from different perspectives from the homeless their concept of place and heritage while also making it available to them as a universal right.